Note : Your request will be directed to BBTLine. 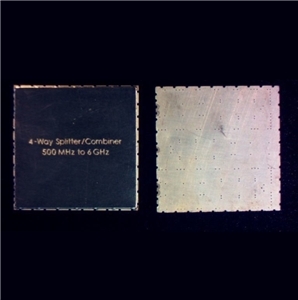 The BBTLine_4Way_SMT from BBTLine is a 4-Way SMT Power Divider that operates from 500 to 7 GHz. It can handle up to 20 watts of power and has an Amplitude Balance of ± 0.15 dB and Phase Balance of ± 2.5 Degree. The divider has a port to port isolation of over 11 dB across the band. It is available in a compact surface mount package. This RF power divider is not a typical Wilkinson-style device, but is based on a design which yields a more compact splitter/combiner with excellent low loss RF characteristics and high power handling capability.